Chelsea Green Publishing Company, 9781603580649, 285pp. 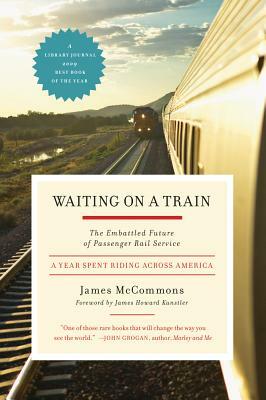 During the tumultuous year of 2008--when gas prices reached $4 a gallon, Amtrak set ridership records, and a commuter train collided with a freight train in California--journalist James McCommons spent a year on America's trains, talking to the people who ride and work the rails throughout much of the Amtrak system. Organized around these rail journeys, Waiting on a Train is equal parts travel narrative, personal memoir, and investigative journalism. Readers meet the historians, railroad executives, transportation officials, politicians, government regulators, railroad lobbyists, and passenger-rail advocates who are rallying around a simple question: Why has the greatest railroad nation in the world turned its back on the very form of transportation that made modern life and mobility possible? Distrust of railroads in the nineteenth century, overregulation in the twentieth, and heavy government subsidies for airports and roads have left the country with a skeletal intercity passenger-rail system. Amtrak has endured for decades, and yet failed to prosper owing to a lack of political and financial support and an uneasy relationship with the big, remaining railroads. While riding the rails, McCommons explores how the country may move passenger rail forward in America--and what role government should play in creating and funding mass-transportation systems. Against the backdrop of the nation's stimulus program, he explores what it will take to build high-speed trains and transportation networks, and when the promise of rail will be realized in America.